Univention Corporate Client (UCC) is a flexible and very economic alternative for the operation and administration of PCs, notebooks and thin clients in companies and institutions. The software contains a Linux-based desktop environment optimised for business use. In addition, UCC serves as a platform for access to remote desktop solutions and virtualized desktops as well as browser or terminal server-based applications. UCC is the successor to the UCS products UCS Thin Client Services and Univention Corporate Desktop. The administration is performed using the standard tools of the UCS management system from Univention Corporate Server and integrates seamlessly in the administration of existing domain resources. The management of Linux-desktop systems (here taking a notebook with a KDE desktop environment as an example). If you only wish to test one of these scenarios, one of the two steps can also be skipped. A UCS system in which UCC is managed (a UCC environment can also be distributed on several systems, this example uses a single-server installation). The UCC images will be stored on the UCS system, so there should be sufficient disk space available. At least 2 GiB of free space are needed for the thin client image and at least 20 GiB for the desktop image. A Windows terminal server for the thin client to access. A thin client. The thin client must have 2 GiB CompactFlash memory. A system on which the Linux desktop is installed. The system should be equipped with at least 20 GiB of disk space (the operating system installation requires 15 GiB plus additional GiBs for the home directory). Detailed descriptions of UCC can be found on the website website and in the UCC manual. UCC requires Univention Corporate Server (UCS) 3.1 or 3.2. The installation of Univention Corporate Server is described in the Quickstart Guide for UCS. UCC can be installed on all UCS server roles. In this example, the installation is performed on a single-server system. Therefore, Domaincontroller master should be selected as system role. Only the DHCP server needs to be selected in the software selection. All available errata updates should be installed on the UCS system. 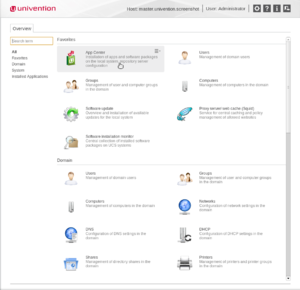 Following successful installation, a login is performed on the Univention Management Console (reachable under https://server_ip/) as user Administrator. 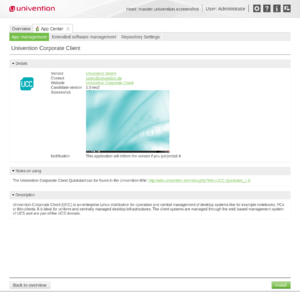 During the first login at the Univention Management Console a dialogue is displayed which allows the activation of the UCS license for the Univention App Center. For this an e-mail address needs to be provided to which the activated license key is sent. The license key can be imported in the UMC by clicking on the gear-wheel symbol in the upper menu bar. The menu entry Import new license needs to be selected. Now the Univention App Center needs to be opened. 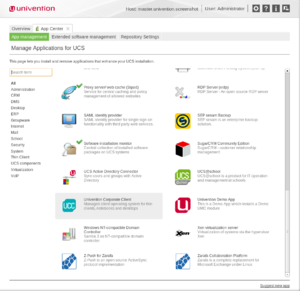 In the Univention App Center, select the Univention Corporate Client application and click on Install. The UCC thin client image is downloaded automatically during the installation. The image size is approx. 300 MB, so the download may take some time. Following that, a new login to UMC needs to be done. Now a user must be created in the user management of the UMC. It is sufficient to perform the minimum required settings. In the UMC, a network object should be set up under Add in the Networks wizard in the UMC. A network object allows the simple administration and assignment of the IP addresses and network settings for systems. It would also be possible to perform manual assignment for the two clients created in this quickstart guide but for demonstration purposes it is done here via the network object. The zones generated as standard during the installation and the DHCP service must be selected under DNS forward lookup zone, DNS reverse lookup zone and DHCP service. Here there is only one entry to choose from each time. By default the reverse lookup zone is created during the installatin of the master domain controller based on the IP address of the master domain controller. If the UCC clients are to be operated in a different IP range an additional reverse lookup zone needs to be created in the UMC and used as the reverse lookup zone. Then the default gateway for the DHCP zone should be specified. This is done by clicking on the Service entry in the list in the DHCP module of the UMC and then selecting the subnet. Then click on DHCP routing in the [Policies] tab. Then click on Create new policy. You can enter any name as the Name, e.g., Routing default, and the default gateway for the network under Routers. Finally confirm with Create policy and exit the DHCP object by clicking Save changes. Additional information on creating policies can be found in the UCS manual. It is important that the MAC address is entered first before the network is selected. This ensures that a DHCP entry for the computer is created automatically. If the network is selected first, the MAC address needs to be selected under DHCP in the dialogue below. Firstly a policy is created in which the Windows terminal server to be used for all the users of the UCS domain is configured. This is done by opening the UMC module LDAP directory, right clicking on users in the navigation tree on the left and then selecting Edit. The thin client is now started. A PXE start must be selected in the system's BIOS. The image is started via PXE and the thin client storage device partitioned and installed following confirmation. The domain join to the UCS domain is performed in the scope of the installation. The join is performed with the Administrator account. In a productive UCC installation, the domain join can be performed completely automated (see the UCS manual). The session RDP must now be selected in the LightDM login manager. A login can now be performed with the user created in the UMC. A connection to the Windows terminal server is created automatically and it is possible to work on the terminal server. Whereas the thin client image is downloaded automatically in the scope of the UCC installation in the App Center, the desktop image must be installed separately. This is done by installing the ucc-desktop-image, which downloads the latest desktop image automatically. The image size is approx. 3 GiB, so the download may take some time. After the desktop image has been downloaded it must be extracted. There should be at least 20 GiB of free disk space available on the UCS system. The client is now started. A PXE start must be selected in the system's BIOS. The image is started via PXE and the harddrive partitioned and installed following confirmation. The domain join to the UCS domain is performed in the scope of the installation. The join is performed with the Administrator account. In a productive UCC installation, the domain join can be performed completely automated (see the UCC manual). The session UCC must now be selected in the LightDM login manager. A login can now be performed with the user created in the UMC. The user can then work with a KDE plasma desktop. General informations can be found in the UCC manual. Help on Univention Corporate Client is offered in the Univention Forum. Errors in the documentation or programs can be filed directly in the Univention Bugzilla. This page was last edited on 15 July 2016, at 11:58.